Twenty thousand years ago, Neanderthals had become extinct. Interbreeding may have allowed some Neanderthal genes to pass down into our own lineage, but the only people remaining on the Earth belonged to our own species. These people continued to live by hunting and gathering, but they also created the world's first art, and developed new technologies for working stone and bone. It was the time of the Late Glacial Maximum, when much of Europe (including the British Isles as far south as Bristol) was covered by permanent ice-sheets. Large animals such as mammoth and reindeer formed an important element in the diet of the people of the tundra. These "burins" from south-west France are specialised tools for working bone and antler. Photo: Didier Descouens (licensed under CCA). 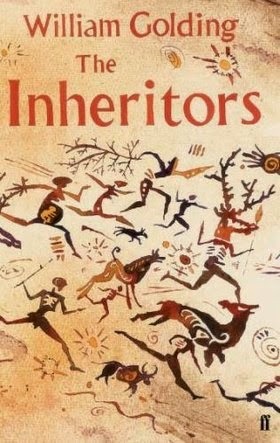 Elizabeth Marshall Thomas's Reindeer Moon is not nearly so well known as William Golding's The Inheritors. It neither won any prestigious literary awards, nor has it enjoyed the commercial success of Jean M. Auel's Earth's Children series. 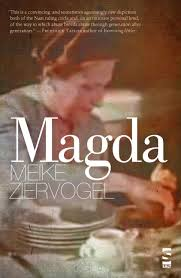 As a depiction of life in the Upper Palaeolithic period, however, I think it is without equal and, as a literary work, I consider it to be a neglected masterpiece. 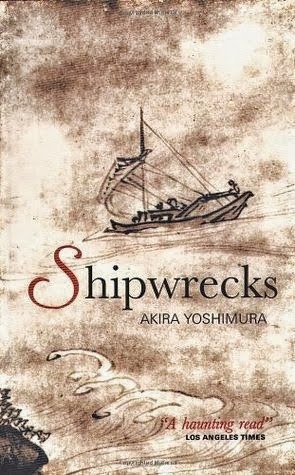 It was only on re-reading it over the past couple of weeks that I realised just how profoundly it influenced my own Undreamed Shores. Marshall Thomas was almost uniquely well-qualified to write a book such as this. The daughter of the American ethnographer, Lorna Marshall, she took part in three expeditions to study the lives of the !Kung people of Botswana and Namibia. Her understanding of what is involved in living as a hunter-gatherer shines through in her writing. 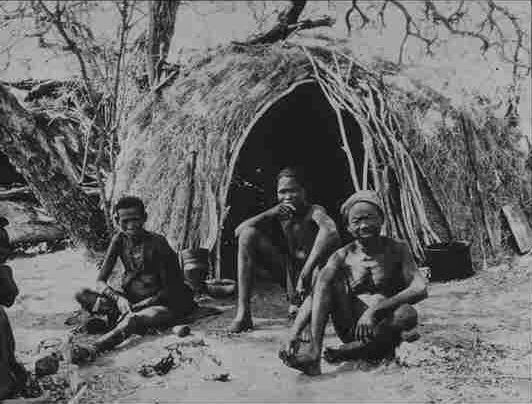 !Kung San people (image is in the Public Domain). "Clasped hands are the sign for a lodge, for marriage, and for strength, since the fingers are the joined antlers of a roof and also the joined people who live under it. So I will show with my hands about the other people of our lodge and how we lived together. The hand palm up with thumb and fingers tight together is the sign for women, water and berries. So I count the grown women on the pads of my fingers and find six. On the first and second fingers of my right hand I find Graylag's two wives - Ina, who was father's sister, and Teal, who was a shaman ..."
Engraving of a mammoth from Mal'ta Buret, Siberia. Photo: Jose-Manuel Benito (image is in the Public Domain). The key events of the plot are the life events common to many women: daily life; puberty; the death of parents; marriage and its attendant difficulties; pregnancy; the petty rivalries and jealousies of an extended family. Yet each of these is explored from the perspective of someone living in a culture profoundly different from our own. Yanan narrates as a spirit already dead, and, in line with the beliefs of modern Siberian shamen, can take on the form of an animal (a wolf, a mammoth, a deer) and experience the world through eyes that are still less familiar. To write convincingly from the point of view of an animal is an extraordinarily difficult task for a novelist, but Marshall Thomas's hand is unfaltering here (perhaps because the Yanan-mammoth or Yanan-wolf is, by definition, partly human), and the result is a joy to read. In archaeological terms, Yanan's people belong to the Mal'ta Buret Culture, directly ancestral to the Native Americans as well as to modern Siberians. Among the most distinctive artefacts of this culture are small bone and ivory figurines of women. 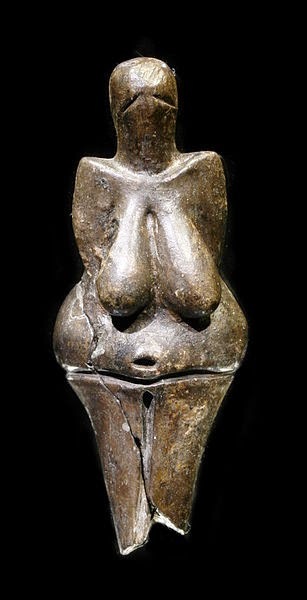 Similar representations (often described as "venus figurines") have been found on archaeological sites in the Czech Republic, Germany, France and Spain, suggesting the emergence of widespread networks of social contact between scattered bands of hunter-gatherers. The "Venus" of Moravny, Czech Republic. Photo: Markis Hlauka [Pescan], reproduced here with permission). 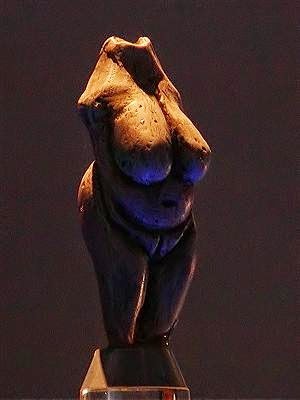 The "Venus" of Dolni Vestonice, Czech Republic. Photo: Petr Novak (reproduced here with permission). The archaeological record of such a distant period is inevitably fragmented, and it is often difficult to glimpse the real human beings behind the artefact typologies and hunting strategies that form the basis of much of the archaeological discussion. Perhaps it is only the imaginative world-building of a novelist such as Marshall Thomas that can breath real life into these people, our ancestors. The sights, sounds, smells, tastes and textures of Yanan's world are as vivid, for me, as the memories of my own youth. Fully modern humans, exactly like ourselves, are thought to have been in existence for around 195,000 years. For 85% of that time, our direct ancestors shared the planet with other human species, somewhat, but not entirely, like us. Within Europe, the best known of these "other" species is the "Neanderthal," so-called after the German valley in which the remains of these people were first discovered. Between 40,000 and 30,000 years ago, Neanderthals and fully modern humans coexisted in Europe but, by the end of this period, Neanderthals had become extinct. Whether they were physically wiped out by our ancestors, or simply lost out to them in the competition for scarce resources, we may never know, but it is precisely the encounter between these two species that provides the starting point for William Golding's novel. Archaeologists and anthropologists have never been able to agree on the question of just how "human" the Neanderthals were. 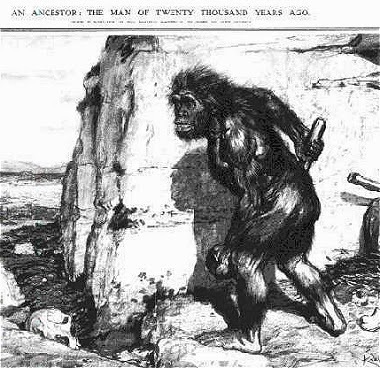 A Neanderthal as imagined by Marcellin Boule and Frantisek Kupka in 1908 (image is in the Public Domain). 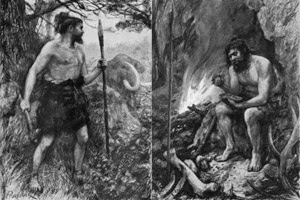 Early modern human (left) and Neanderthal (right) as imagined by Sir Arthur Keith and Amedee Forestier, in 1911 (image is in the Public Domain). 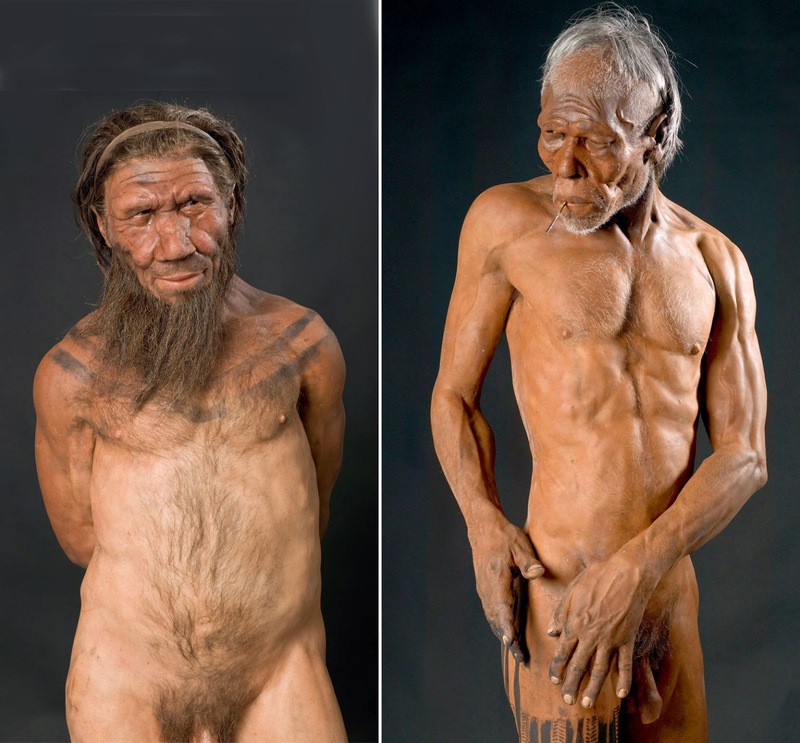 Neanderthal (left) and fully modern human (right) as displayed in an exhibition currently showing at London's Natural History Museum (copyright: Trustees of the Natural History Museum, London). "He jumped up and faced the people and the night air shook his curls. Fa grinned at him ... he squatted. 'Now I have a picture in my head. Lok is coming back to the fall. He runs along the side of a mountain. He carries a deer. A cat has killed the deer and sucked its blood, so there is no blame ...'"
"There were too many things to see at once. To begin with, the trees had reorganised themselves. They had crouched down and woven their branches closely so that they made caverns of darkness on either side of the fire. The new people sat on the ground between Lok and the light and no two heads were the same shape. They were pulled out sideways into horns, or spired like a pine tree, or were round and huge ..."
Skull of a Neanderthal woman, found at Swanscombe. Photo: Natural History Museum (copyright: Trustees of the Natural History Museum, London). "The red creature stood on the edge of the terrace and did nothing. The hollow log was a dark spot on the water towards the place where the sun had gone down ... The red creature came trotting back to a dark hollow in the side of the cliff ... The creature wrestled with a rock that was lying on a mound of earth, but was too weak to move it ..."
Finally, Golding shows us the viewpoint of "the new people," with a new protagonist, Tuami, sitting at the helm of a boat as he steers it away from the forest of the "devils" back towards "lower lands, plains perhaps where men could hunt in the open, not stumble among dark trees or on hard, haunted rocks." Tuami and his companions have left devastation behind them, but he asks "What else could we have done?" If Golding had attempted to produce an archaeologically accurate picture of life among the Neanderthals, it would, by now, be out of date. 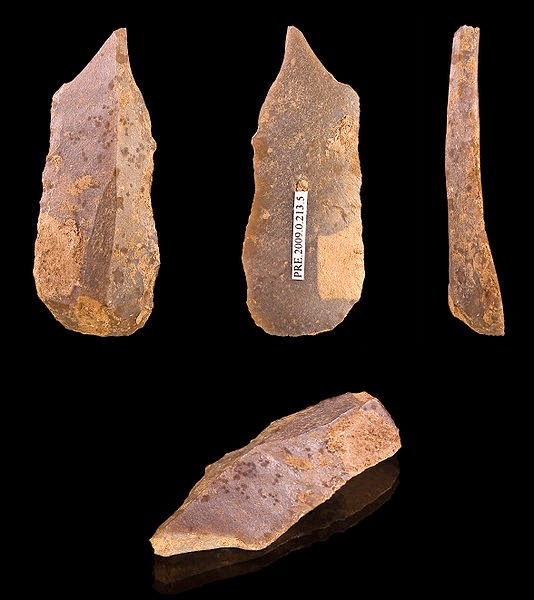 We may question the crudeness of the tools used by Lok and his family, and doubt whether the early modern humans they encounter would really have had boats with sails at such an early date. This, however, would be to miss the point. Golding's story is about the evolution of the human imagination. Lok's people live permanently in the present tense, and struggle to imagine a world that is other than the one they know. Tuami's people have our own imaginative faculty, which carries within it the seeds of civilisation, and of empire, but which also endows them with jealousies unknown to Lok's people and with, perhaps, the most fearful of all human capacities: the ability to fear that which poses no threat. 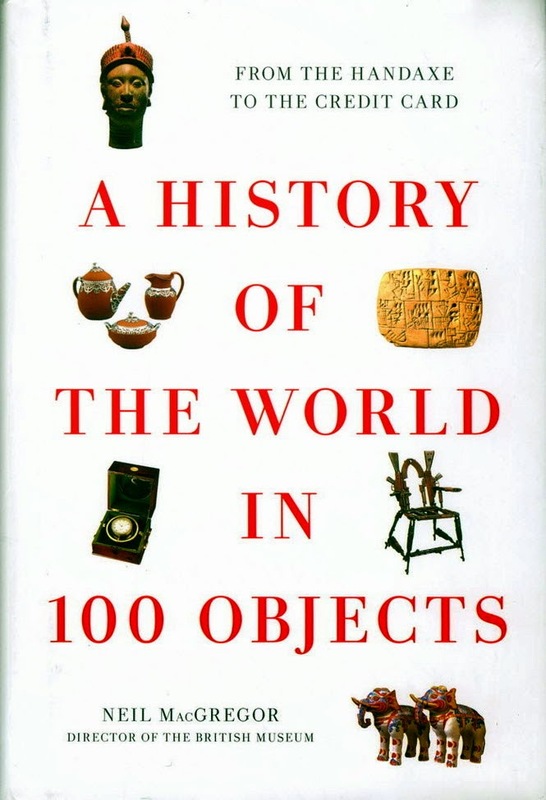 Several of my friends received from me, last Christmas, a copy of Neil MacGregor's A History of the World in 100 Objects. One of these friends subsequently commented to me that, if MacGregor can tell the history of the World with 100 objects, I could surely tell it through 100 novels. The idea was sufficiently intriguing for me to start drawing up a list, but the first conclusion I reached was that, with novels, a list of 100 would simply be too long. It takes far longer to digest a novel than it does to appraise an object. 50 might be a more manageable number. My first draft was altogether too predictable (how could one not include Don Quixote, Robinson Crusoe, Great Expectations, War and Peace), with too many books that people are likely either to have read, or already have on their "to read" list, or have decided are not "for them." There could be little interest in sharing such a list and, in any case, what could I possibly say about War and Peace that has not already been said? One could, of course, tell the history of the novel in fifty examples (a list that might run from The Tale of Sinuhe via The Satyricon, Don Quixote and Ulysses to If, on a Winter's Night, a Traveller...), but that would be a very different exercise, and one which, at least for the moment, I will leave to others. A focus on historical fiction seemed to offer more possibilities, but I decided at an early stage to allow the ancients and our contemporaries, on occasions, to speak for themselves (the former because I think there are some ancient "novels" which offer fascinating windows into the civilisations that produced them, and which are not nearly so well known as they might be; the latter because nobody else has yet had the opportunity to write about them). 50. 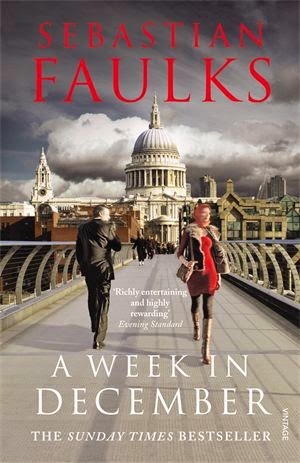 Sebastian Faulks, A Week in December. There is, needless to say, nothing "definitive" about this list, any more than there is about MacGregor's choice of objects. The "history" told will not be the conventional history of kings, queens and battles: it will be, in Fernand Braudel's terms, much more focussed on "La Longue Duree" than on "L'Histoire Eventionelle," and it will be intentionally subjective, reflecting the distinct contribution that fiction can make to our understanding of the human past. I hope, however, that it will be a shared journey in which everyone has something new to discover in the world of fiction. Historical Fiction and the Third Reich: Thoughts on "Generation War"
Television viewers in the UK have recently seen a subtitled three-part drama serial, produced in Germany and dealing with the Second World War from the perspectives of five young Germans. 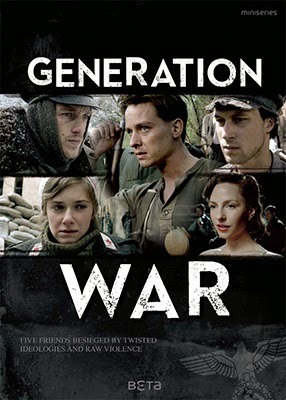 Generation War: Our Mothers, Our Fathers, follows the lives of five friends from 1941 to 1945. None of the main characters are committed Nazis, although four of them become caught up in the movement with varying degrees of acquiescence and reluctance. The fifth character, Viktor Goldstein, is Jewish, and survives the war through a combination of resourcefulness and good luck. As a work of drama, it has been highly acclaimed, but, as a depiction of history, it has been criticised. It has even been the subject of a televised debate, which is available, for a limited time, on BBC I-Player. This debate raises some interesting questions relevant to all writers and readers of historical fiction. In the televised debate, Professor Eva Hoffman described aspects of the series as being "implausible to the extent of being ahistorical," whilst Professor David Cesarani accused the film-makers of "playing fast and loose with the past." In the course of the debate, however, it became clear that the objections focussed principally on just two scenes. The first scene, in which the five friends gather in a bar, was considered to be implausible on the basis that Jews were not, in 1941, free to associate in public with non-Jewish Germans. There was much discussion in the debate about the distinction between "implausible" and "improbable," and writers, readers and viewers will have their own degrees of willingness to suspend disbelief. There was no suggestion that Viktor's experience was in any way typical of that of German Jews, and most of us (not just historians) know that this is very far, indeed, from being the case. All the same, I wouldn't personally have used that storyline. A scene in the third episode presents the Polish Resistance in a very unflattering (and, in the view of the historians, inaccurate) light, with minor characters shown to be almost as resolutely anti-Semitic as the Nazis. This has prompted protests from the Polish Ambassador in London. That anti-Semitism existed in Poland is well attested, as is the fact that many Polish Resistance workers risked their lives to protect Jews. The criticism here, therefore, is not of implausibility, but simply one-sidedness, and it could easily have been addressed by including a debate among the Resistance workers (I thought it a failure of characterisation that one woman in the group didn't argue Viktor's case, given that she had formed a bond with him, and had been set up as both a brave and a sympathetic character). 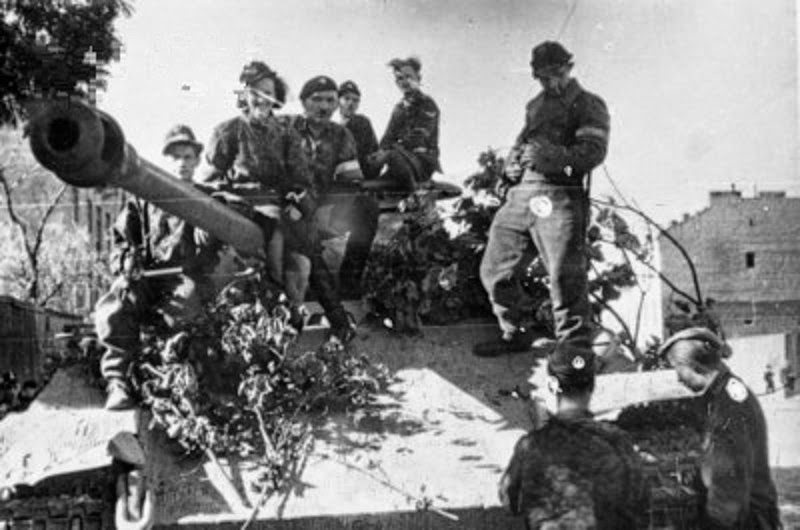 Men and women of the Polish Resistance with a captured Panther tank. The image is quite different from that presented in Generation War (image is in the Public Domain). Anne McElvoy described the series as "Downtonesque." I think this to be unfair (it deals with very serious issues, and seems to me, despite its flaws, to take them seriously). I did think, however, that the plot had far too many coincidences, reuniting the friends under highly improbable circumstances and helping them to sustain their friendship and connections. Creative writing students are taught, at a very early stage in most courses, to avoid devices such as this. Taken as a whole, the series does not gloss over or minimise Nazi atrocities, nor does it present its main characters as passive victims: two of them (serving in the regular army rather than the SS) are drawn into committing outrages against civilians, whilst a third voluntarily betrays a Jewish woman to the authorities. Imperfect though it is, I thought it a strong drama and, on balance, more likely to inspire debate than to mislead. The televised debate, however, raised some much more fundamental questions about the responsibilities that fall upon those of us who fictionalise the past. These questions are thrown into sharp relief in fiction that deals with events in the relatively recent past, and in relation to which emotions are still highly charged. One screen-writer, Anthony Horowitz, suggested that writers could do as they please, that we are in the business of popular entertainment, and have no obligation to portray the past accurately (he did also make the point that we should stop short of outright distortion or "propagandisation"). Entertainment is part of what I, as a writer, seek to do, but it is not my sole aim (and, if it were, I would steer clear of the Holocaust as a focus of attention). Professor Sir Richard Evans seemed to be suggesting that it is simply not possible for fiction to fathom the motivations of people in the past. I am more optimistic than he is about the scope of the human imagination. Generation War is arguably part of a trend that has emerged over the last decade, during the course of which it has become more acceptable to explore German viewpoints in relation to the Second World War. This does not make it acceptable, for example, to deny the Holocaust, or to justify Nazi atrocities (the sort of "propagandisation," presumably, that Horowitz had in mind), but exploring the recesses (including the darkest ones) of the human psyche is one of the things that fiction does best, and has done since the days of Homer and Aeschylus. The past cannot be out of bounds to dramatists and novelists, although a clear distinction should be made (as it was not by ancient writers such as Tacitus and Cassius Dio) between the writing of history and the writing of historical fiction. There are pitfalls to be avoided, prominent among them what Cesarani calls "presentism" - the characters in Generation War are, in his view, "modern Germans," with modern attitudes, "catapulted back" to 1941. I'm not sure this is entirely fair (many characters expressed views that I would not expect to hear today), but most of us have read historical novels and watched historical films or TV programmes in which this weakness is prominent. 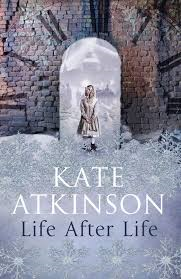 Kate Atkinson's Life After Life and Meike Ziervogel's Magda are two novels which avoid both this pitfall, and the more serious one of historical implausibility. I have reviewed them both in an earlier blog-post, both are carefully researched and, in their different ways, I believe that they both lead the reader towards a deeper reflection on some of the most traumatic events of the 20th Century than most are likely to draw from factual history alone. Mark Patton's novels, Undreamed Shores and An Accidental King, are published by Crooked Cat Publications. E-book editions may be purchased from the Crooked Cat Bookstore, and paperback versions from Amazon UK and Amazon USA. In 1866, the Reverend J.G. Joyce was excavating the basilica (town hall) of the Roman town of Silchester, in Hampshire. Already, in the 19th Century, the significance of this site was clear - a substantial Roman town which (unlike London, Colchester, York or Chichester) had not gone on to be a substantial medieval or modern town, potentially leaving the archaeology undisturbed and easily accessible. 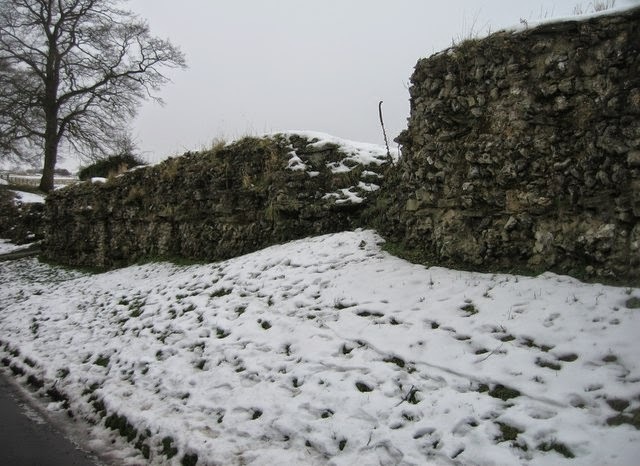 The Roman town wall of Silchester. Photo: Sebastian Ballard (licensed under CCA). Despite his high expectations of the site, nothing could really have prepared Joyce for his most spectacular discovery, a large bronze sculpture of an eagle, its wings missing, but its feathers and feet gloriously moulded, making it, in the words of the archaeologist, Jocelyn Toynbee, "by far the most superb naturalistic rendering of any bird or beast as yet yielded by Roman Britain." It is currently displayed at Reading Museum. The Silchester eagle. Photo: Marcus Cyron (licensed under CCA). Objects that are truly unique, as this one is, always pose a problem for the archaeologist. So much of what we know of the distant past is based on making comparisons between one object and another, so that, if we have nothing to compare this object with, there is little we can say about it. We can't for example, date it with any accuracy, or have any certainty about the way in which it was displayed or used. One plausible interpretation of the Silchester eagle was that it was part of a legionary aquila, a military standard. We know that every Roman legion had an aquila, that the soldier who carried it, the aquilifer, had an important status within the Roman army, and that the loss of a legion's aquila brought shame on the entire legion and its commander. Three legions, with their aquilae, were lost in the Battle of the Teutoberg Forest in 9 AD, and subsequent generations of soldiers risked their lives to recover them, returning them to Rome, where they were probably displayed in the Temple of Mars Ultor. 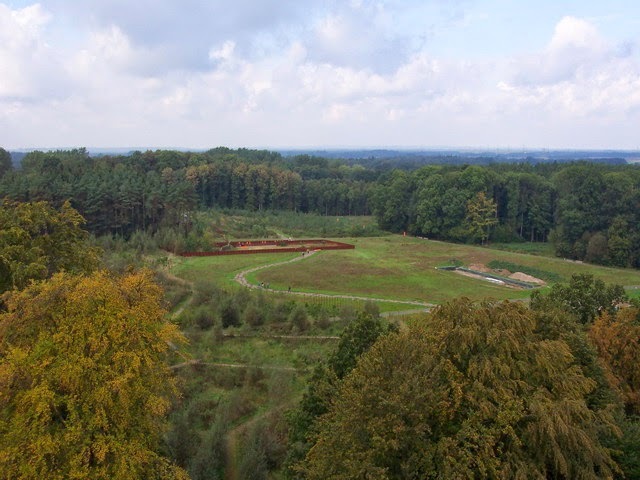 Kalkriese in Germany, identified as the site of the Battle of the Teutoberg Forest. Photo: Jens Reimann (licensed under CCA). 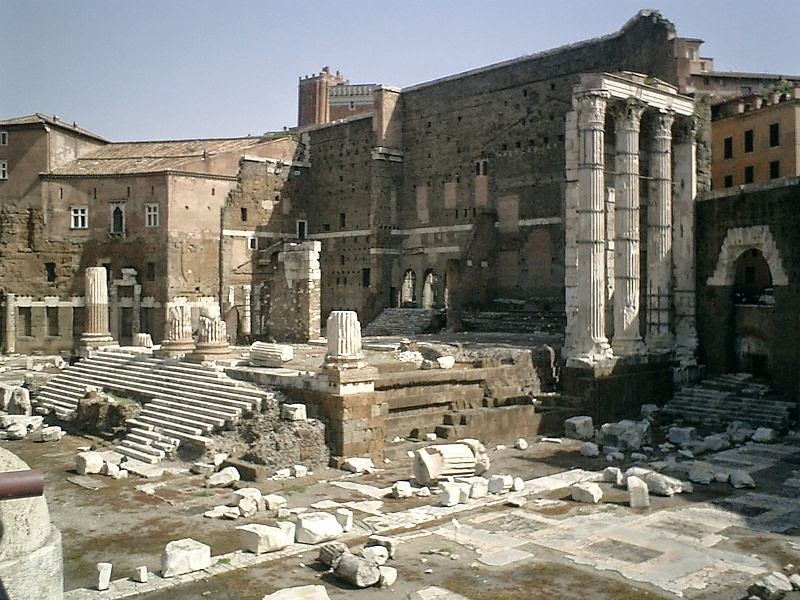 The Temple of Mars Ultor, Rome. Photo: Louisana (licensed under GNU). 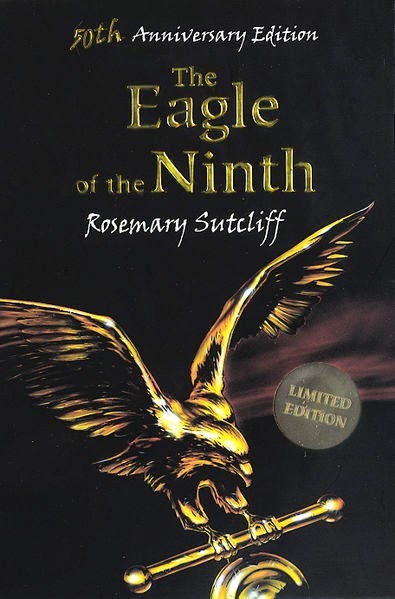 The Silchester eagle, together with what was known about legionary aquilae more generally, inspired Rosemary Sutcliff to write The Eagle of the Ninth, a novel that many of us remember from our childhoods. In her story, the eagle is the aquila of the Ninth Legion, which disappeared in Scotland in 120 AD, and her protagonist, Marcus Flavius Aquila, is on a mission to recover it. Sutcliff's novel, in turn, inspired Kevin Macdonald's 2011 film, The Eagle, in which Channing Tatum plays the part of Marcus Aquila. Most modern scholars, however, do not believe that the eagle found at Silchester was, in fact, a legionary standard. If it were, it would have been the only one to have survived. To gain an idea of what a real aquila might have looked like, we have to rely on pictorial depictions. Coin of Mark Antony, depicting the aquila of his III Legion. Photo: Panairjdde (licensed under GNU). 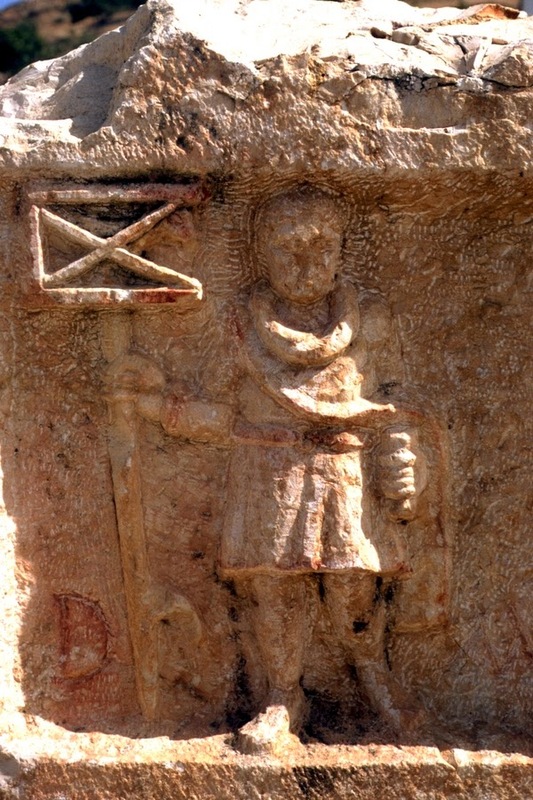 Tombstone of the aquilifer, Felsonius Verus, found at Apamea, Syria. His standard appears to be a real eagle in a small cage. Photo: Man Vyi (licensed under CCA). If the Silchester eagle is not a legionary aquila, what is it? The curvature of the feet suggest that it originally stood on a globe, which may in turn have rested in the hand of a god, probably Jupiter, a bronze statue in the forum of the Roman town. Close examination suggests that it was already ancient when it was buried (probably in the 3rd Century AD): its wings, and probably its feet, had been broken and replaced. "As we were riding through the burned town, one of the Thracian soldiers called out to us, and walked towards us, cradling something in his hands. He was holding it so carefully that, at first, I thought it must be a living animal, a puppy or a kitten, perhaps, that had somehow survived the conflagration. 'Who should I give this to?' he asked. I reached out, and he handed me a bronze eagle. It was scorched and battered, and its wings were missing, but it was still recognisable. 'It is from the statue of Jupiter!' said Milonius. I handed it to Catuarus. 'Will you take responsibility for rebuilding the town, and putting this back where it belongs?'" In a course I am currently teaching, we explore the significance that physical objects have for people, taking examples from the present, the recent past and the remote past. We look at the complex histories or "biographies" that many of these objects have. The Portland vase is one of the objects we cover, and this also makes an appearance in An Accidental King. Every object in every museum potentially has stories to tell, although these stories change as we learn more about the objects themselves. I can't imagine writing a historical story without including real objects: with so many to chose from, it would seem rude not to! As a means of telling stories about the human past, verse has a much longer history than prose. Homer's Iliad, Virgil's Aeneid, Guy d'Amiens's Carmen de Hastingae Proelio and Wace's Roman de Brut & Roman de Rou are all verse narratives, telling of events in the recent or distant past (as seen from the perspective of their authors), and combining factual and fictional elements in ways that are not altogether dissimilar from the art of the modern historical novelist. They build on one another, Wace drawing self-consciously on Virgil, just as he himself had drawn on Homer. Epic poetry as an art-form might be thought to have had its day, but then, in today's Guardian, Will Self argues that the literary novel is set to follow it into obscurity. Whilst fashions come and go, however, an art-form once established is rarely lost altogether. The works of Homer and Virgil have been in print continuously since the invention of the printed codex, and were among the first texts to be made available as e-books. "The midshipman swayed in the coach, trying to read. A wire-coop of white chickens between his feet ..."
As they get. 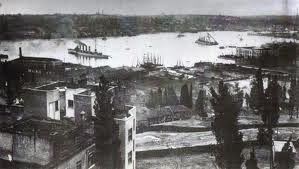 No one would touch me, nor my food ..."
Turkish warships in the Golden Horn during the First World War (image is in the Public Domain). Counterparts. I picked my moment. Curled up like a giant slug, still dribbling. 'Does he need one?' 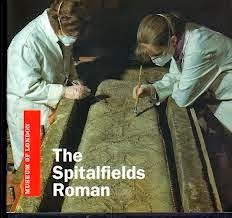 do you think ..."
The excavation of the Roman lead coffin, which inspired Evaristo's novel and protagonist. Novels in verse will probably never occupy more than a tiny niche in the larger market for narrative fiction. It is notoriously difficult to make one's living as any sort of poet, let alone as an epic or narrative poet, and, when agents periodically publish lists of the sorts of books they are looking for, "novels in verse" don't generally feature on them. 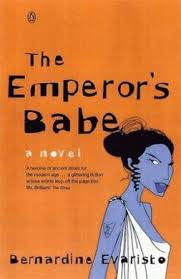 Despite this, Omeros, Fredy Neptune and The Emperor's Babe are among the best works of fiction in any genre that I have read in recent years. Even if I never attempt a novel in verse myself, I think there is something that all writers can learn from the ways in which these authors use and enjoy the language in which they write. 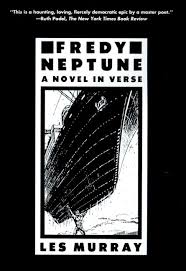 I recently gave a group of students two texts to compare: the first was an extract from Fredy Neptune, but with the line-breaks removed, so that it had the appearance of prose; the second was an extract from Jim Crace's Harvest, a prose novel, but with line-breaks added, so that it looked like poetry. Most confidently asserted that the first was prose, and that the second was poetry, but the real point was that both works had been written with an attention to detail, at the level of the individual sentence, that is more characteristic of poetry than of prose, and this is something that any writer can seek to emulate. Mark Patton's novels, Undreamed Shores and An Accidental King, are published by Crooked Cat Publications. E-Book editions can be purchased from the Crooked Cat Bookstore and paperback versions from Amazon UK and Amazon USA.